I absolutely adored Jessica Pennington’s debut Love Songs & Other Lies (read my review here) and I was so excited about having the chance to read her sophomore novel, When Summer Ends, early! 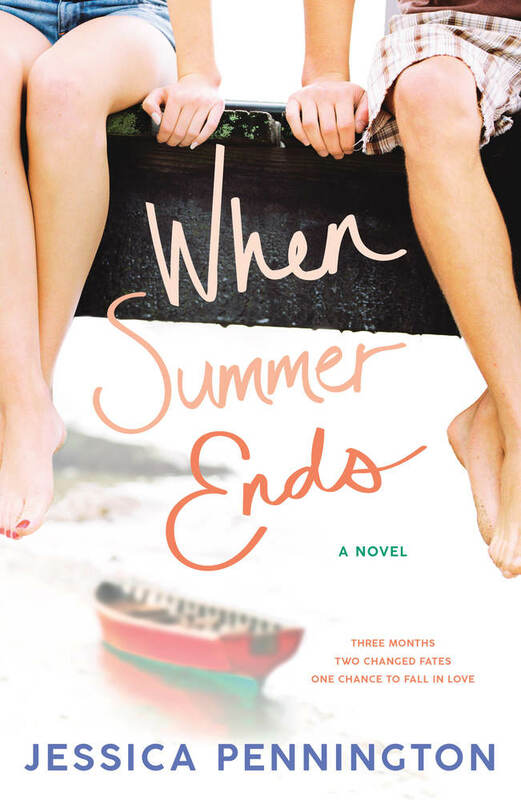 I’ve been having the hardest time writing this review because I honestly loved When Summer Ends so much and don’t know how to put my thoughts into words. Anyway, I’m saying all of that because this review has turned into more of a love letter. Olivia has everything figured out, but that all changes when her aunt announces that she got a new job in Arizona and that Liv will have to move before her senior year begins. All of a sudden everything else changes—her summer internship falls apart and her long-term boyfriend doesn’t see the point in continuing their relationship since she’s moving away. With no other summer job options, Liv turns to the River Depot where all the tourists hang out…and where the school’s golden boy, Aiden, works. Aiden’s the star pitcher of their high school baseball team. That is until an eye disease messes with his vision causing him to lose the playoff game and then quit the team on the last day of school. With a summer free of baseball, Aiden is excited about working on his art portfolio and at his family’s rental business. Liv and Aiden’s POVs were fantastic! Both of their voices and struggles felt so realistic. It was so easy to get inside their heads and relate to them. I really liked how they knew of each other since they went to school together but never knew each other before this summer job. It was so fun seeing Olivia try new things with Aiden as he pushed her outside of her comfort zone. Also, I really loved how Aiden was this all-star athlete, but also that he is talented artist too! Yay for multiple interests! Yay for loving both sports and art! The small-town setting and River Depot added the perfect backdrop to Liv and Aiden’s budding relationship. I loved all of the fun activities they did—the whole book just screams summer with all of the canoeing, exploring, late nights, and bonfires! Like Olivia, I’m not a huge outdoors person (although I was when I was little), but I would hike a sand dune any day if that meant I got to meet a guy like Aiden. Another big part in the book was watching Liv slowly reconnect with her mother, who has been absent most of her life. The way their relationship progresses felt so natural and I really liked that they found something small (drinking tea in the morning) to bond over and how that helped jumpstart their living together. I’m glad that everything wasn’t 100% okay between them at the end because Olivia’s hurt feelings are valid, but I’m glad they are trying to move forward and mend their relationship. Overall, you are going to want to add When Summer Ends to your summer reading list this year! Sarah Dessen and Morgan Matson better make room for a new YA summer romance queen! This sounds like an awesome book! I have Love Songs & Other Lies but haven’t gotten to reading it yet, thanks for the inspiration! LS&OL is so good too! You definitely need to read Jessica Pennington’s books! I hadn’t heard of this book before your review, but I definitely have to read it now! Live love summer contemporary! It comes in April! You’ll definitely love it if you enjoy summer contemporary romances!! I am even more excited about this one now. I am still reading March books, but I should get to this soon. Like you, I loved Pennington’s debut, and everything you said in your review has me feeling good about this one. Oh this sounds SO CUTE! I love a summer contemporary! It was the cutest!! You’ll definitely love this one!